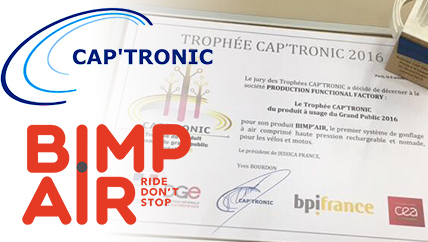 Thursday October 6, Bimp’Air Team was invited to the 10th edition of the CAP’TRONIC award, organized by the JESSICA association, aiming to reward the most innovative French SMEs incorporating electronic and software solutions into their products. 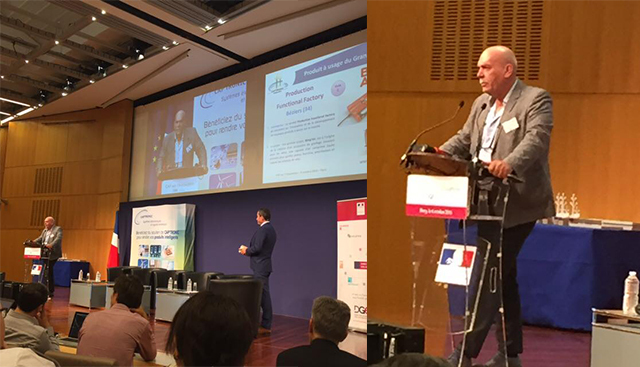 In partnership with CEA and Bpifrance, the ceremony took place in Paris at the Ministry of Economy, Industry and Digital on the occasion of the event FOCUS ON INNOVATION on the theme of ‘the growth of SMEs by the ‘Internet of Things’. After 3 years of product development, Bimp’Air, which offers a revolutionary inflation solution with the first rechargeable and portable compressed high pressure air system, was rewarded. The jury, composed of entrepreneurs, experts and journalists selected 12 most innovative business projects in several categories. And it’s in the category of ‘Product for use of the general public’ that Bimp’Air stood out. We know the capsule and its high pressure loading system in the world of cycling, but it is also an everyday tool. Inflation of bike tires, adjustment of fork and shock absorbers, the Bimp’Air technology is multidisciplinary and also adapted for tires of bike, scooter, car… Easy to use and to carry, and of disconcerting speed, the product can become a valuable ally in everyday life for inflation of balloons, wheelchair tires… The Bimp’Air capsule, very functional and with colorful design, becomes the new inflation tool for home. This ‘CAP’TRONIC TROPHY’ comes to crown years of research and development and contributes to the progress of the Bimp’Air adventure in France and around the world. Bimp’Air award-winning at the 2016 CosmoBike Tech Awards!